Disperse stagnant blood, soften and dilate blood vessels, to maintain healthy cholesterol level and normal blood pressure, “to sharpen the vision and hearing, calm the nerve and clear the brain”, and to dispel heat and remove toxins. Cholesterol Guard Herb Tea (Caffeine-Free), is made of chrysanthemum, rhubarb (rhei rhizoma) and jujube, nicely flavored with jasmine. These herbs contain adenine, choline, vitamins A and B, amino acids, glycoside, emodin, rhein, saponins, etc. Chinese medicine uses them to disperse stagnant blood, soften and dilate blood vessels, to maintain healthy cholesterol level and normal blood pressure, “to sharpen the vision and hearing, calm the nerve and clear the brain”, and to dispel heat and remove toxins. 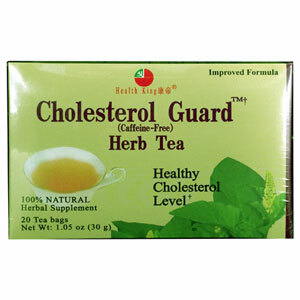 Be the first to review “Cholesterol Guard Herb Tea” Click here to cancel reply.